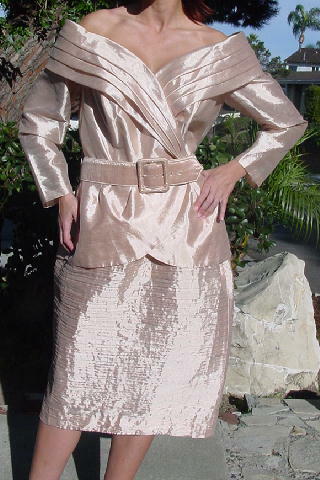 This 100% polyester light golden lame with a touch of peachy-bone color two piece outfit is by Barbara Barbara Woman. The top has a 12 1/4" wide V neckline and a 5 1/2" wide 4-tiered collar that flows into lapels. The right front side crosses over the left. The left side has two inner buttons to hold it in place and the right has an exterior button which is hidden by the fabric matching belt, which has tiny rhinestones on the face of the fabric covered buckle. The top has fabric matching belt loops. The sleeves have 1 3/4" bottom slits with a sleeve end fabric covered button and loop. The bottom has curved front sides. The back has four wide pleats. The top has a dark golden lining (not the sleeves) and the interior shoulder area has a 1" wide fabric covered elastic strap. The skirt has a horizontal line crinkled surface with a 6 1/2" long left side zipper and 1 button left side waistband closure. The back has a 5 3/4" wide inverted V slit kickpleat. The back of the 1" waistband has a loose elastic inset. 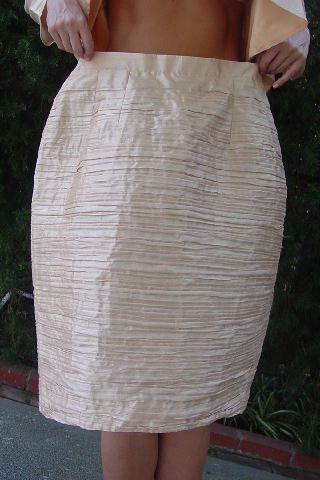 The skirt has a bone color see-through lining. The tag says size 18.
neckline side to side 23"
neckline to sleeve end 23"
shoulder to bottom side hem 27"
1st hole 41", last hole 37 1/2"